Beth Dooley: ELF ON THE SHELF! - Real Holiday Spirits! ELF ON THE SHELF! - Real Holiday Spirits! The spirit of Christmas is, well, elusive. But real spirits are easy to find and to give. Those visions I waxed on about in last week's post, the walnuts and pomegranates, cards and the tree, remain just visions. It sounded pretty good, right? I've got a quicker fix for home made gifts. Holiday spirits, real spirits, some for me and some to share. Flavored Vodkas. Vanilla, citrus, rosemary, apricot, cranberry vodkas are easy to make, lovely to give. Use good vodka, one that is clean tasting yet indistinct (not too expensive). Find great looking bottles and jars. Do it now and it will be ready in a week or so. It's not as messy as making cookies, quicker than putting up chutney. And, it is home made. 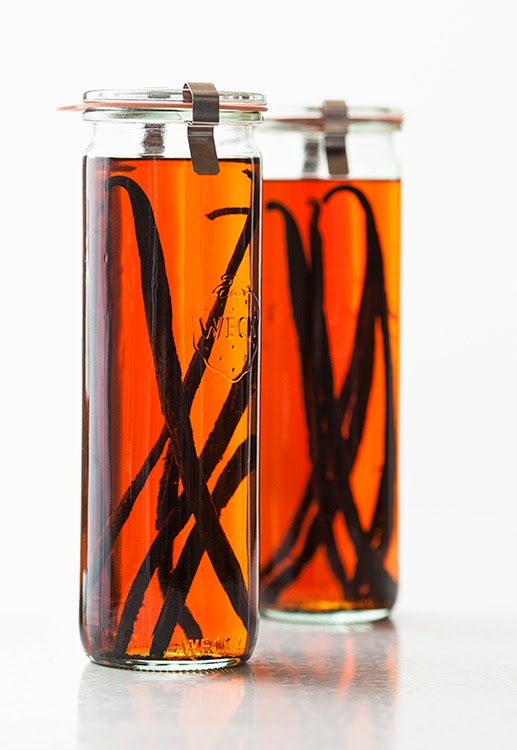 Vanilla Beans: Split 4 to 6 vanilla beans down the center, put into tall container, fill with vodka. Give just as they are. Rosemary: Rinse 4 to 6 rosemary sprigs and put into a tall container, fill with vodka. Give just as they are. This vodka makes an awesome Bloody Mary! Kumquats: Cut the kumquats in half, put enough in to fill the container 1/2 way. Fill with vodka. Before gifting, strain off the vodka, remove and discard the kumquats. Put a few sliced kumquats in the container and refill with the flavored vodka. Cranberries: Fill a container with cranberries. Add the vodka. Before gifting, strain off the vodka, remove and discard the cranberries. Put a few fresh cranberries into a container and refill with the flavored vodka. Apricots: Fill a container with dried apricots. Add the vodka. Before gifting, strain off the vodka and remove the apricots and place in a different container. Put a few new dried apricots into a container and refill with the flavored vodka. Put the vodka soaked apricots in another gift container (these are delicious sweetened with a little sugar and spooned over ice cream or cake.